Here is a cautionary tale. 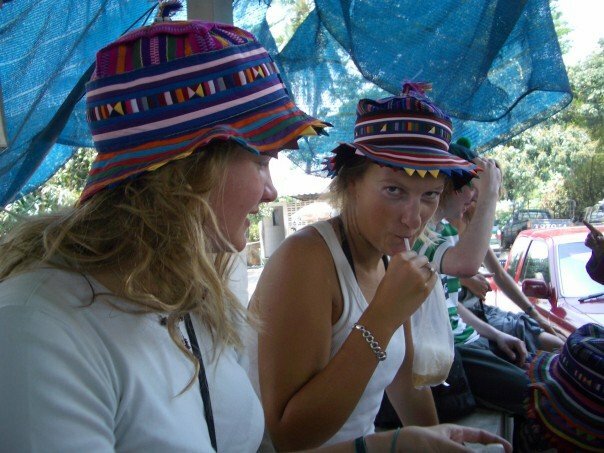 When I was 18 I went to Thailand on my gap year with two girlfriends, Sarah and Cara. It was in the south of the country, on the island of Phi Phi, that we decided to get tattoos. A woman on the boat to this island told us we couldn’t possibly go to Phi Phi – famous for tattoos drawn with bamboo cane – and come away unblemished. She herself was so covered in swirling patterns she looked like a Moroccan tile. You could hardly tell which bit was tattoo and which bit was woman. But she seemed nice enough and were were 18 and the idea of a bamboo tattoo from a Thai island felt much more exotic than life back in the Home Counties. Two days later, I lay on a grubby mattress while a Thai man tattooed my right foot. A spliff as thick as a chipolata drooped from one end of his mouth. He was needling a design that Sarah had come up with. She called it ‘a tree of love’, a faintly Hindu design with five branches and each point on this tree, Sarah claimed, meant something like ‘family’, ‘peace’ or ‘honour’. You are susceptible to this sort of stuff aged 18 on your gap year. So we all got the same tattoo – Sarah on her back, Cara and I on our feet. I don’t remember it hurting because I’d put away several glasses of Thai whisky. Tattoos finished, we paid the man our agreed sum – $1 each – and went off to the nearest bar for more whisky. Ah, what adventures. We were young, we were free, we had blown raspberries at our boarding school education. We were tattoed! What rock stars. Smash the system and so on. Until, that is, we got home when Sarah was further probed about the design by other friends. And it transpired that what we had been permanently marked with was not a ‘tree of love’. It was something else. ‘Do you remember Mrs Peers?’ Sarah said to us. I did not. Mrs Peers had taught us about Stalin’s Five-Year plan. I hadn’t noticed her file much while she went on about the Stakhanovites. Turns out, Sarah had been paying less attention to the Stalinist polices of Russia in the 1920s and 30s and had instead been drawing copies of her file. ‘It was from WH Smith,’ Sarah explained. So, the upshot was we had returned from our mind-expanding travels inked not with a mystical design from the East, but a WH Smith pattern. I mention this story mostly for the benefit of Brooklyn Beckham, who has recently turned 18 and celebrated by getting two tattoos. One of a Fujitsu camera on the inside of his left bicep; another of a Native American on his left forearm. No surprise there. David Beckham, his dad, is covered with an estimated 40 tattoos. And tattoos are entirely unshocking these days anyway. Practically everyone in Debrett’s has one. If you’re still a bit unsure about them, you can always stick a tattoo on your foot, like me and Samantha Cameron (who has a little dolphin on her right heel) so you can hide it when you go to stay at Balmoral. You do need to be careful about the heritage of the tattoo, though. Brooklyn Beckham has copped some criticism for being ‘disrespectful’ to Native American culture. Seems a bit unfair. His father has exactly the same tattoo on his torso so maybe the Beckhams have Native American ancestors. Who knows. But my point is you should think very seriously about what you’re having done, because otherwise you may end up branded with a design from a stationery chain.